The Lollaland Play Mat is the perfect play mat for the entire family. It provides a spacious, protective, and comfortable surface for both parent and child to play on. It is great for tummy time, rolling over, sitting up, crawling, first steps and even as a large exercise mat. 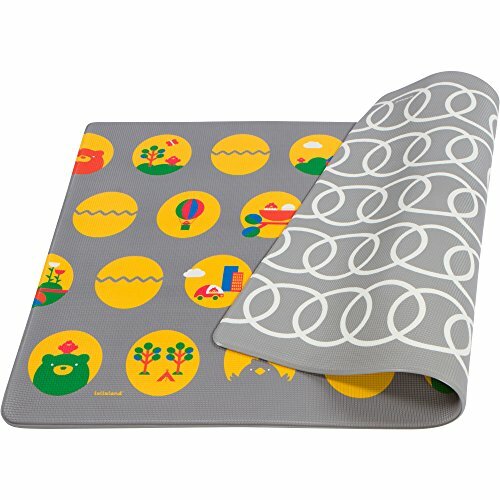 The Lollaland Play Mat features a reversible design that is chic and fun. It is a great non-toxic, hypoallergenic, alternative to a rug, because it is ultra-cushioned, water proof, and easy-to-clean. One side provides fun, educational graphics that encourage parent-child conversations and the other side reveals a more sophisticated side that makes a beautiful statement-piece in any nursery or playroom. If you have any questions about this product by Lollaland, contact us by completing and submitting the form below. If you are looking for a specif part number, please include it with your message.